How often do you argue with your partner? Was it before you turned off the light last night or as you were setting off for work this morning? Can you remember what your falling out was about? Over a quarter of British couples are arguing at least once a day. According to our findings, 29% of couples across the map are having one daily row, and 11% admitted to arguing several times a day. Across the month, the number of us getting into a few disagreements with our partners reached 60%. Although you’re most likely to get into arguments regularly from the ages of 35 to 44, this all seems to settle down around the age of 45. From then onwards, we found that instances of disagreements between couples begin to dwindle – possibly because we’ve spent the previous decade bickering and we’ve run out of things to fall out over. Perhaps unsurprisingly, most of arguments are about issues around the home and how it’s run. Our top three results are close, with general mess being the main cause for friction at 26%, followed by money at 22% and interior design decisions being a major bone of contention for 21% of us. In fact, when it comes to home interiors, men are more than twice as likely (12%) to initiate an argument over how the house is looking, while only 5% of women start the décor argument. Heating-wise, women are half as likely as men to get miffed, with 5% launching into rows over the radiators while 10% of men are getting annoyed about warming the home. Young couples in their first home are the most likely to be bickering. We found that 14% of 18 to 24-year-olds are feuding over home interiors the most. Up until the age of 45, general mess is the main point of contention and after that, money is the most contentious topic. Speaking of money, Mancunians are fighting over this more than any other subject. There are 34% of couples finding this the biggest issue. Our survey revealed that couples in Bristol and Edinburgh are most likely to be quarrelling several times a month (56%), and Scotland’s capital is also home to the most argumentative couples in the whole of the UK – 35% are falling out several times a day there. Over in Liverpool, though, everything’s a lot rosier, with only 21% of Scousers arguing with their partners. When it comes to home décor, head to Sheffield for some harmonious decision-making about everything from the blinds to the new extension, with 67% of couples deciding what they want together. In Glasgow, however, 54% are making decisions about home furnishings without chatting to their partner about it first. Surprisingly, we found that 42% of respondents are more likely to make home interiors decisions on their own, with 49% of women taking this into their own hands. Age is also a factor. Our youngest age group in the 18 to 24 age bracket wouldn’t have a discussion with their partner over furnishings and décor (79%). Redecorating a particular room in the home is a dream for 22% of UK couples, while 16% want a new kitchen and 12% are hankering after a new bathroom. When it comes to creating a whole new room, men are more likely to want to take the plunge and prioritise building an extension (22%) than women (14%). 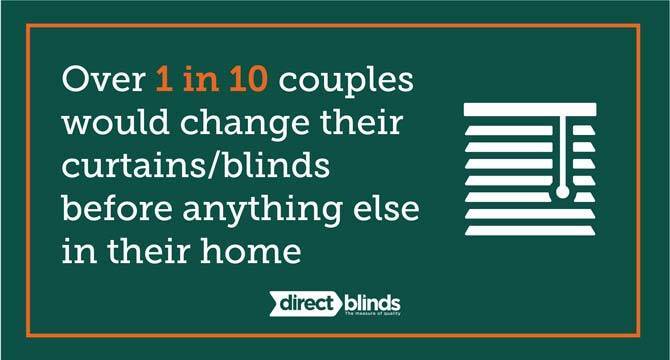 Over one in 10 would change their curtains or blinds before switching or updating anything else and women are most likely to care about updating their blinds (16%). Meanwhile, perhaps unsurprisingly as it may be their first home, couples in the 18 to 24 age bracket are more interested in buying new furniture than any other home improvements (32%). Whether you’re a young couple in Edinburgh who’ve just moved in together or you’re an older couple in Manchester who are redecorating the home, you’re sure to agree on our selection of blinds and curtains. With an array of options available, there’s plenty to pick from and you’re sure to find the window dressing for you.